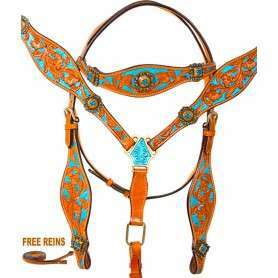 Beautiful complete western tack sets featuring horse headstalls (bridle), reins, and breast collars. Really make your horse stand out with hand made designs for showing or for pleasure. From basic designs to fringe, we have the perfect set for you and your horse! 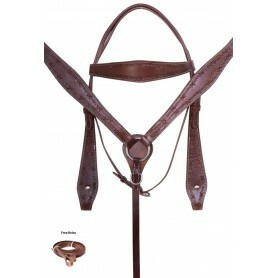 This is a beautiful looking nylon bridle sets that will hold up to the rigors of every day use and still look great. 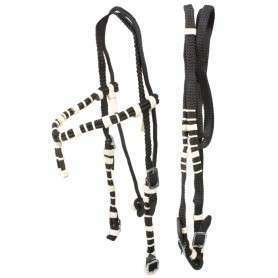 This bridle set features tough nylon braiding and white accents for a classic appeal. This gorgeous western horse tack set features blue crystals and shiny silver concho embellishments that will make your horse stand out! On sale for only $89.99! 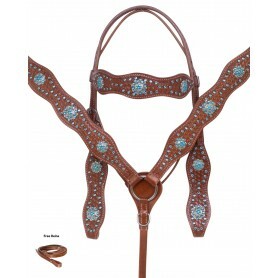 Hand painted in a beautiful turquoise inlay, this western horse tack set will make you stand out! 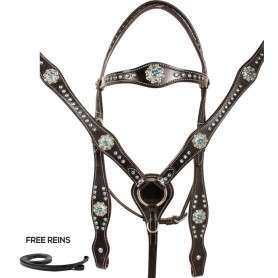 Headstall, reins, and breast collar for only $89.99 today! 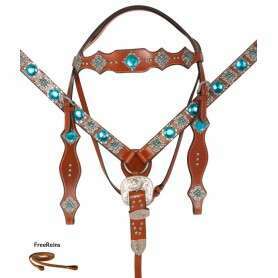 This beautiful, one of a kind tack set features silver conchos and turquoise blue colored rhinestones throughout, giving the set a blingy belt style, complete with silver buckle! Perfect for barrel racing at the rodeos and on sale for only $89.99 today! This gorgeous western horse tack set features blue crystals and shiny silver concho embellishments that will make your horse stand out! On sale for only $74.99! 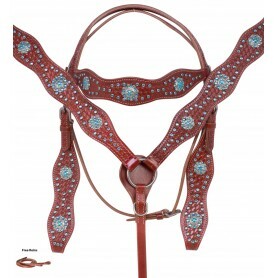 This gorgeous red mahogany western horse tack set features blue crystals and shiny silver concho embellishments that will make your horse stand out! On sale for only $74.99! 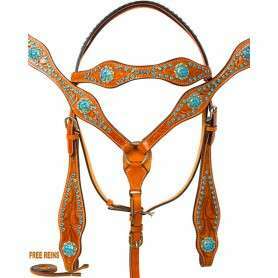 This western horse tack set is designed to match most brown saddles. Featuring a barbed wire tooling design on premium thick leather that give this tack set a classic western look. On sale for only $69.99 today!